International wine critic scores maiden vintage 91/100. 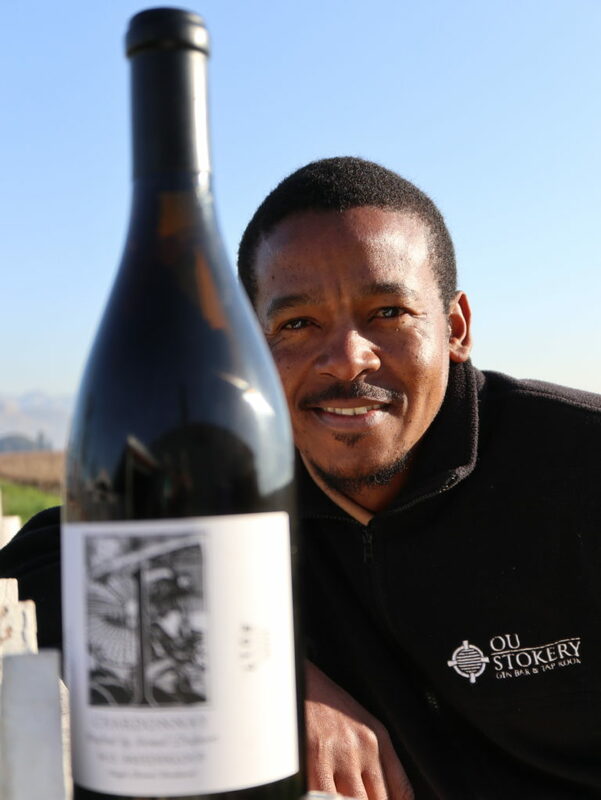 With a clear focus on changing the way people view wine, Israel Delport, former tractor-driver and now assistant winemaker at Stofberg Family Vineyards, has just released his maiden wine: a Chardonnay, simply called ‘1’, referring to the single barrel in which this precious liquid was fermented and matured. Israel left school when he was 16 to work as a general farm worker, and quickly realised that he felt passionate about winery-related work. It was this positive demeanor that secured him a position in the cellar, where Israel’s natural talent inspired Mariëtte to enroll him for a wine training course at Elsenburg. Here, Israel again excelled, becoming one of only ten students chosen to participate in an exchange program to Burgundy. What followed was a series of firsts: Israel, who only ever traveled as far as Beaufort West, was flown to France, where he completed an internship at Domaine des Terres de Velle – a small boutique Domaine. His internship of six-weeks left a lasting impression, and he returned home with the goal to make wines in the Burgundian style, in the Breedekloof wine valley! Mariëtte fully supported this dream, and under her mentorship and guidance, this vision has now come to fruition: a classy, understated old-world style Chardonnay is now bottled under the name Israel Delport. And the international wine community is taking note too: renowned international wine critic, Tim Atkin, recently included the wine in his 2018 South African Report, describing the wine as having “flavours of citrus and créme fraiche, with fine lees and understated oak” – and scored it 91/100, placing it among some of South Africa’s finest wines. Israel reveals that cellar practices involved gentle whole-bunch pressing, to extract the free run juice to ferment in a steel tank. After 15 days the juice was transported to a 3rd fill French-oak barrel to complete fermentation and in which it was matured for nine months. The result is nothing short of beautiful: the Chardonnay has a bright and rich acidity which mirror the citrus-like aromas in the wine. The generous perfume of the wine further reveals pear and yellow apple, as well as a chalky edge. On the palate, the consumer is rewarded with a hint of toast, butterscotch and a marzipan-like richness – a distinct characteristic of white wines made from grapes grown at Stofberg Family Vineyards. Israel’s Chardonnay ‘1’ is a spectacular effort, not just for its physical attributes, but for the hope it represents. “It is a dream that has been answered,” says Israel – and one consumers can now all share in. Only 250 bottles of the Israel Delport ‘1’ has been bottled, and it sells for R500 a bottle from Stofberg Family Vineyards. Thanks to the sponsorship of Roto Labels who printed the labels, and Sumi Creative Design who assisted with the design, expenses were kept at a minimum, with 100% of the proceeds paid to Delport to plough back into his dream.